arnold holstein. A family business. A family business that has grown naturally. Our location in Markdorf on Lake Constance is no accident. In the Lake Constance region, one of the major fruit growing areas in Germany, distillation was cultivated early on as a way to process fruit. 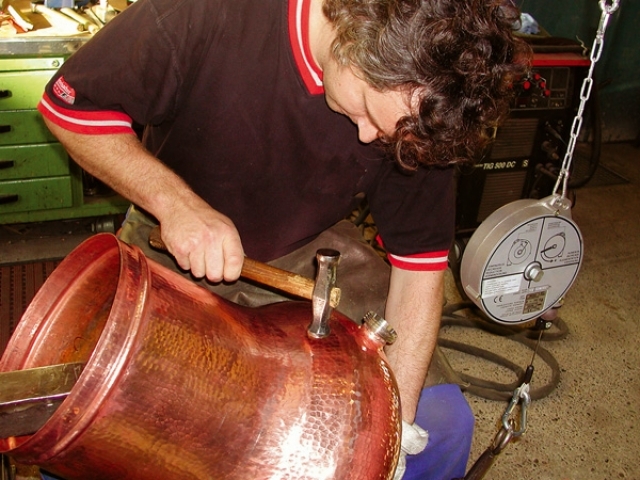 So in 1958, Arnold Holstein Senior founded a coppersmith, initially supplying the fruit farmers in the area, then later in the Black Forest and in neighbouring Swiss and Austrian regions. 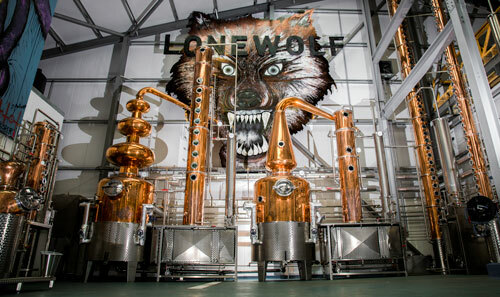 The business grew steadily: Today, the mid-sized company is being run by the fourth generation, supplying state-of-the-art distillery technology around the world. The efficiency, reliability and longevity of our units are the result of uncompromising, quality craftsmanship – Handcraft for Craft Spirit. This is backed by tradition, with good reasons: We manufacture everything in Germany – in Markdorf and Eriskirch on Lake Constance. 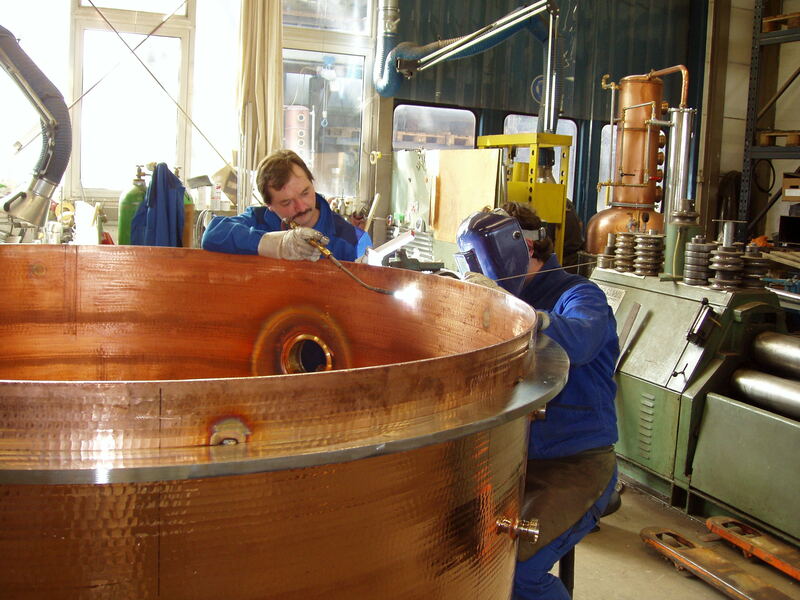 We are the plant mechanics, coppersmiths, designers and engineers. Additional quality-ensuring factors are our consistently high product quality, active training in our establishment, an annual welder examination for plant mechanics as part of the TÜV certification and inspection. 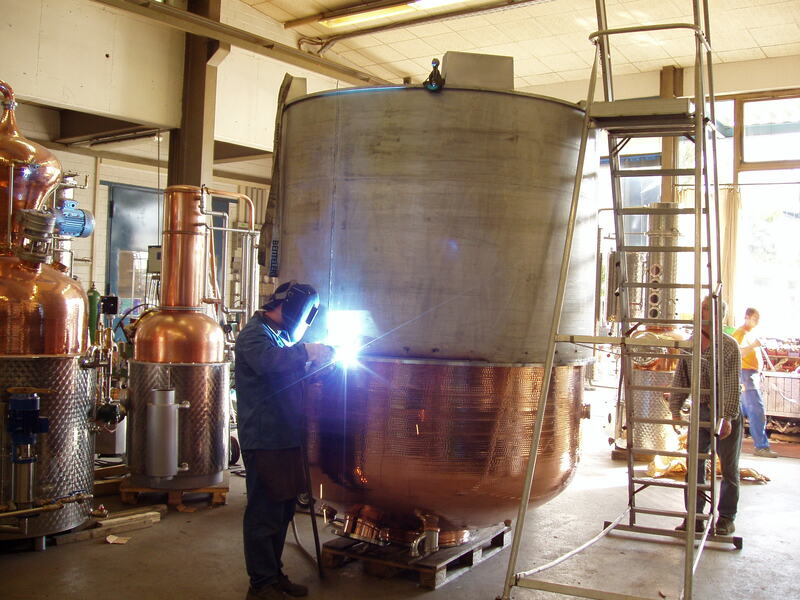 As a leading manufacturer of distillation units, we offer custom-made designs for small and licensed distilleries with a quantity range of 20 to 300 litres. Fill content for commercial & bonded distilleries as well as industrial alcohol production is 150 to 10,000 litres. In addition, you will find continuously operating distilleries – as well as methanol removal units – in our manufacturing assortment. Assembly, start-up and service on site at your location – worldwide. We supply the right distillery to produce the finest premium fruit distillates, such as Williams, cherry schnapps, mirabelle plum schnapps, plum brandy, raspberry brandy and Calvados. 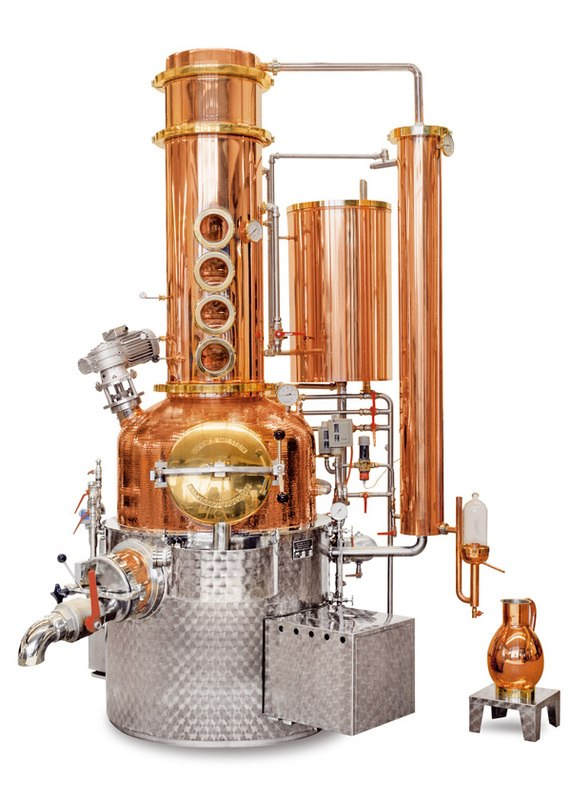 As well as the production of whisky, vodka, rum, cognac, armagnac, grappa, arrak, gin, tequila, ouzo, raki and aquavit. The fruit processing machines are an additional product of ours. Including straining machines, inclined conveyors, mixers. To compliment the programme, we also supply all auxiliary materials and devices for mash preparation. 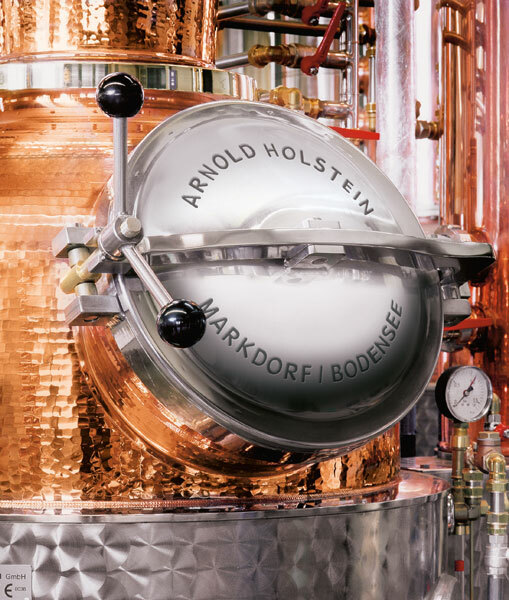 Comprehensive consulting, uncompromising quality craftsmanship and innovative technology – these are the ingredients for the efficiency, reliability and longevity of Holstein units, and for the success of top distilleries. Furthermore, our service ensures that everything runs perfectly from the first day onwards. On site at your location, worldwide. Also, as a family business we offer you the assurance that replacement and additional parts will be available in the future. After all, our distilleries are an investment of real value. 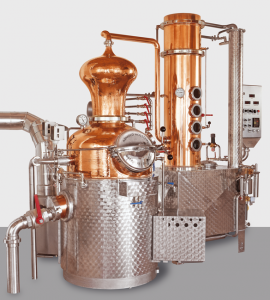 Holstein distillery units can be upgraded with our accessories to meet your individual needs. Contact us, we are happy to assist you. We don’t deliver off the shelf – we deliver the ideal unit for your needs. That’s why there is an initial comprehensive consultation; that’s why the planning of your unit is distinguished by individual circumstances and the specific distillation task. Reap the full reward of our know-how stemming from many years of experience, a high level of manufacturing competence and ongoing development. 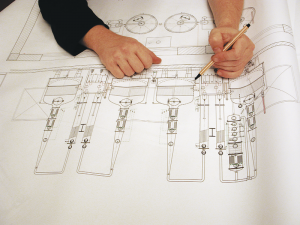 In addition to specialised units that are completely unique in design and execution, our modular system enables a high degree of flexibility. This way tried and tested components can be combined in a cost-effective manner on customer-specific units. Taste and aroma – also a matter of technology! Year after year, many of our customers are distinguished with national and international distillery awards with top placements for whisky, rum, gin, and fine distillates. Scientific studies, for instance at the Hohenheim and Weihenstephan Universities, impressively show that outstanding distillation results can be achieved with units from the house of Holstein. State-of-the-art and innovative processing techniques play a decisive role here. Our sophisticated automation, cleaning and catalyst technologies ensure easy handling with optimum results. Innovation in the details – sophisticated column designs combined with effective cleaning methods for thoroughly clean copper surfaces. Last but not least, our unique, patented catalyst technology ensures highly aromatic top-class distillates. 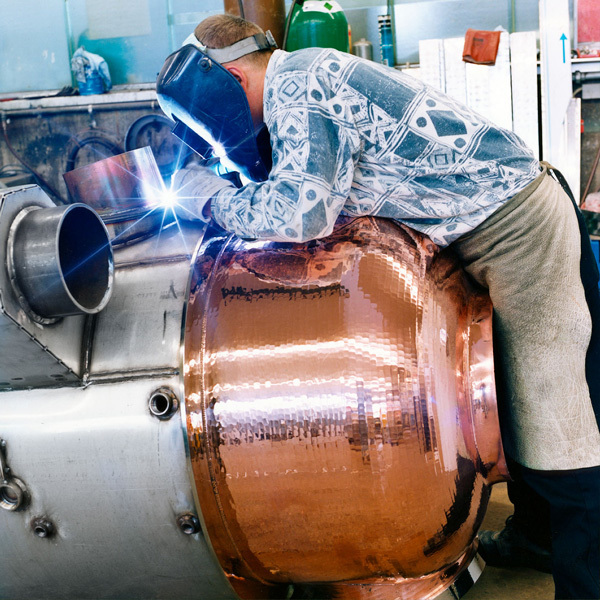 Distillery equipment from Holstein – known around the world for innovation and quality. Have a look yourself, we look forward to your visit! All distilleries operated with excess pressure of 1 bar are built according to European Pressure Equipment Directive 97/23/EU and have a CE-mark. Without the mark, an operating pressure of max 0.5 bar is permitted. 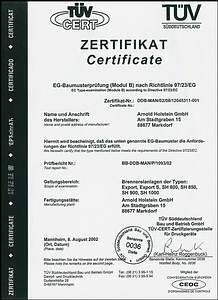 With this in mind, we have applied for a certification through TÜV, which means that an EU-type inspection was performed for all distillery types in Arnold Holstein GmbH’s product portfolio. The type inspection ensures that all manufactured distilleries meet the requirements of this directive. 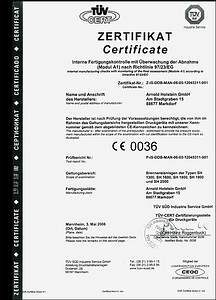 All materials built onto the units and add-on parts for safety must correspond with the directive and exhibit the corresponding certificate. All welding specialists involved in the production of the devices must participate in a periodic TÜV inspection: this ensures the constant quality of their work. The certification was successfully received, which continues to guarantee manufacturing according to the latest guidelines and at the highest level. 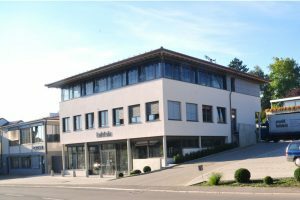 In addition to distilleries in the greater Lake Constance region, our customers include leading manufacturers of fine distillates and internationally renowned alcohol producers. A splendid confirmation of the excellence of our units is the top placements that our customers win year after year for their products at national and international award ceremonies. 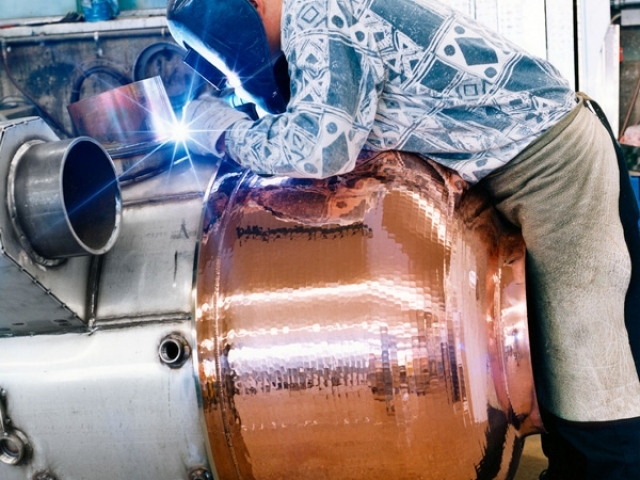 As a Plant Mechanic you produce the parts and piping for modern distillery units in our team and install the units. The training to become a Plant Mechanic at Arnold Holstein GmbH is interesting and diverse. Rounding, chamfering, drilling, milling and welding copper, stainless steel or other metals – this and much more is part of the Plant Mechanic’s profession. As a recognised 3.5-year apprenticeship occupation with dual training, Plant Mechanics are listed in the employment agency’s portal. Are you interested? We offer various internship options to become familiar with the business.